Two years ago, I reviewed CITIES OF MARS’ first full length album, "Temporal Rifts." I absolutely loved it, giving it a big old 10 across the board. Two years not only is the album still in my regular rotation but the band has also dropped another full length, "The Horologist." So, how does it stack up to their perfect full-length debut? This Swedish Doom Metal trio not only avoids the sophomore slump, they even surpass their debut. For those who loved the concept of the first album, this one continues the story of a cosmonaut discovering an ancient Martian city. Musically, it is everything the first album was but more—every idea has been pushed a step further. The band reaches in deep and pulls out of all the stops for a sound that crosses the line from just being music to be a true soundscape. The first track, "Necronograph," releases a thick fog of fuzz then a monstrous riff settles in. Palm’s vocals retain the clean shout that still works so well within their realm. His bass is a meaty and wide, stuff to the brim with all the low-end Doom riffs one could ever want. Likewise, Noren’s guitar playing effortlessly displays a huge, heavy tone that brings the riffs out loud and upfront. 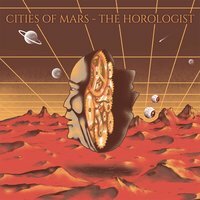 Even when he is playing something a bit more introspective, his playing is still as tall as Olympus Mons.“The Horologist,” really excels at the more psychedelic/ambient aspects of the songs; the mid-section is spacey as looking upon the stars at night and fits right in with the album’s science fiction story. There are many moments throughout the record that really just open up one’s mind to imagination, creating worlds and painting pictures. The band experiments with some unconventional tones as well—the beginning moments of the third track, “Inner Sanctum, Outer Space," sounds, at least to me, a bit oriental. This sound grows into full-fledged clean instrumentation, one that highlights the bands ever evolving ideas but also the bass and drums. As just a three piece, Kuchler has the huge responsibility of keeping the bands overall sound full but also expanding it open. This part of the song is very moving, beautiful even. Even among the expansive ideas at play across the album, the band still drops the hammer when needed. “Hydrahead,” is built around the audio equivalent of a wrecking ball ripping through a building. The solo towards the end starts out at a methodical pace but ends up shredding and leads the song to a heavy-handed end. “The Floating Museum,” is a crusher of a track with everything one could need in a Doom song. It is easily heavy enough to move the mountains of Mars, or anywhere else for that matter. The final track, “Lines In The Dark,” mixes a lot of different guitar parts together, displaying styles of Doom, ambient, and even some Prog. It is a potent mixture but a big pay off to end the album on so strong a note. This one reminded me of “Blood Mountain” era MASTODON but more dark, and obviously, Doom filled. CITIES OF MARS have really out done themselves here, somehow able to move their sound forward while also keeping the elements that make them so great to begin with. “The Horologist” is an album with many layers and contains a depth most bands can’t even dream of achieving even half of. A very, very strong contender for one of the best Doom Metal albums of the year. Doom is my favorite sub genre of Metal and albums like this are a shining example as to why.